Thank you for your interest in becoming a Virginia Master Naturalist. We invite you to become a part of the state's "first and oldest" chapter. Our chapter has a unique legacy. It was started in 1994 by Mike Hayslett and followed him through several Central Virginia communities, training over 200 individuals by 2006. 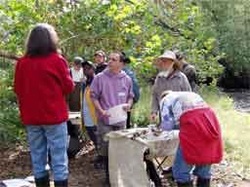 Following this "pre-history" to the state-wide program, the Central Virginia Master Naturalists became the first chartered chapter in Virginia during 2006. With a moniker reflecting this distinction ("the Peaks View Pioneers"), the Central Virginia Chapter continues our training tradition begun some 20 years ago! We currently have over 70 active members! The Central Virginia Chapter will be holding our next Basic Training Course in the Spring of 2018 beginning on February 21. Classes will meet one night per week for 12 weeks with some field trips on weekends. The purpose of the basic training is to prepare participants for volunteering as Master Naturalists in our community and establishing a base of natural resource volunteers. Download the application and a tentative syllabus below. Complete the 40 hours of basic training course with participation in all of the field trips. A maximum of 2 absences is allowed and time must be made up by arrangement with coordinator. Applicants must be 18 years old by the start of basic training. Youths ages 14 to 17 are welcomed provided an adult is responsible for them and they are both registered participants in the class. If you have additional question about Basic Training you may contact the Basic Training Coordinator, Greg Eaton. For questions about any other topics related to the Central Virginia Master Naturalist programs including requests for assistance on projects, contact John Powers, Chapter President.